The Third Epistle of John (also referred to as 3 John) is a book of the New Testament. It is the sixty-fourth book of the Christian Bible—its second-shortest book by number of verses, and its shortest in regard to number of words (according to the King James Version). Though short, the letter describes a fascinating set of circumstances. The writer—who calls himself simply "The Elder" rather than "John"—asks his correspondent, Gaius, to disobey the local church leader and provide hospitality to a group of missionaries with whom The Elder is familiar. The writer denounces the head of the local church for refusing communion to these strangers and "spreading evil nonsense about us." The writer hopes to come soon to the city, when he will give this local leader his comeuppance. In the meantime, Gauis is asked to take the risk of receiving the very persons whom the local church has banned. The letter is traditionally ascribed to author of the Gospel of John and the Book of Revelation. Few critical scholars believe that Revelation is by the same writer, and opinion is divided as to whether the epistle is by the same person that wrote John's Gospel. Its date is estimated variously at between 90 and 120 C.E. The letter is apparently a genuine private letter, written for the purpose of commending to Gaius a party of Christians led by person named Demetrius, who were strangers to the place where Demetrius lived, and who had gone on a mission to preach the Gospel (verse 7). The city in question is not identified. The writer mentions that he has also written to "the church" of this city, which may or may not be a reference to the church addressed 2 John. However, the situation here is different than that described in 2 John, for the writer here is asking for hospitality for his missionary friends, while in 2 John he is warning against providing hospitality to certain persons who preached the heresy known as Docetism. The writer complains that his letter to the church has not been acknowledged, or possibly that the leader of the church, Diotrephes, refuses communion with him altogether. This Diotrophes "loves to dominate, (but) does not acknowledge us." The reference raises intriguing possibilities. Is Diotrophes merely a local bishop who does not appreciate the meddling of an older leader from a neighboring church, or are there theological issues at stake as well? Apparently, more is involved than merely "the Elder's" authority or the expense of helping these missionaries, for Diotrephes "will not receive the brothers, hindering those who wish to do so and expelling them from the church." Thus, the author of 2 John encourages Gaius to provided hospitality to persons to whom the local church refuses communion, and asks Gaius himself to go against the authority of the local leader. This is ironic, considering that in 2 John, the writer demands that the local church itself refuse communion to preachers of whom he himself disapproves. In any case, it appears that a schism is in the making, for the writer threatens that "If I come, I will draw attention to what he (Diotrophes) is doing, spreading evil nonsense about us." The Elder pointedly tells Gaius that "Whoever does what is good is of God; whoever does what is evil has never seen God." It is clear that he places Diotrophes in the latter category. He concludes by telling Gaius he will have much more to say about the matter when he comes, but does not want to say more at the moment because "I do not wish to write with pen and ink." He asks Gaius to greet "the friends by name," possibly a reference to other Christians generally, but more probably meaning those who are willing to side with the Elder against Diotrophes on the issue of receiving Demetrius and his colleagues. Like the other epistles of "John," the letter is written by a man who identifies himself only as "the presbyteros"—meaning "elder"—and is addressed to Gaius (or Caius). This was a common name in the Roman world, and while some commentators identify Gaius with the Gaius of Macedonia in (Acts 19:29), the Caius in Corinth in (Romans 16:23) or the Gaius of Derbe (Acts 20:4), it remains uncertain who the recipient truly was. 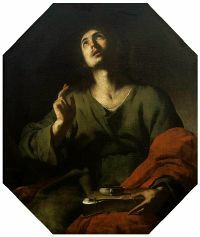 The issues of the writer's identity are essentially the same as with 1 John and 2 John, and not all critics agree that the letters are by the same author. He is nowhere named as John, but by tradition he is thought to be the same person that wrote the Gospel of John. All three epistles are clearly written by a person or persons who used some of the identical words and theological concepts that John's Gospel does, but many critics are convinced the author(s) of the epistle is different from that of the Gospel. Even fewer believe that the Book of Revelation—the only New Testament writing in which the author's name is specifically mentioned as John—is by the same writer. Nevertheless, both traditionalists and critical scholars are in agreement that the epistle is probably a relatively late work, with early estimates at around 90 C.E. and later ones at no later than 120 C.E. Early twentieth century commentator Edgar Goodspeed saw this and 2 John as cover letters for 1 John. The language of this epistle is remarkably similar to 2 John, and it is the scholarly consensus that the same man wrote both of these letters. However even in ancient times some believed that John the Presbyter was different to the Apostle John who wrote 1 John, and this was affirmed at the Council of Rome in 382 C.E. The earliest possible attestations for 3 John come from Tertullian and Origen. The Muratorian Canon listed the two letters of John only. By the early fourth century, however, it was more widely accepted. 3 John (various version) Bible Gateway. Kirby, Peter. 3 John Early Christian Writings. John, Third Epistle of Easton's Bible Dictionary, 1897. The Third General Epistle of John from Kretzmann's Popular Commentary of the Bible. History of "Third Epistle of John"